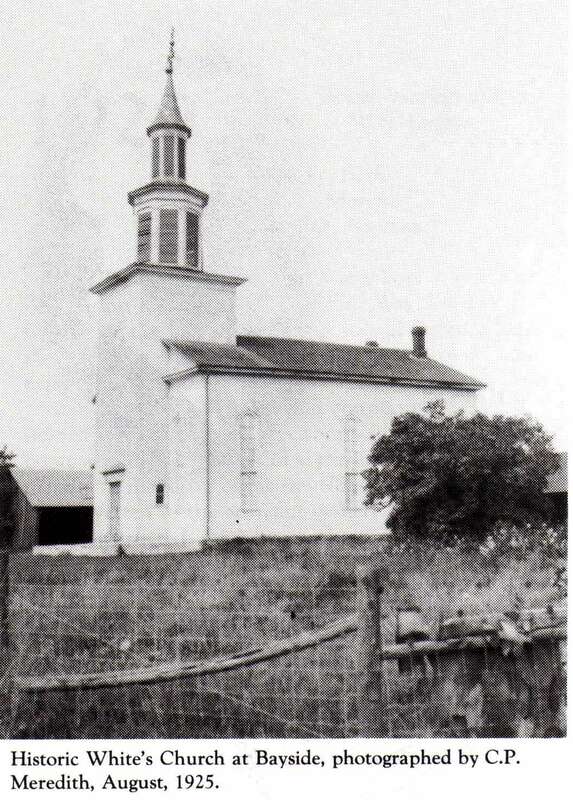 White's Church was built in 1841 on an acre lot severed by Reuben White from his lot at the northwest corner of White's Road and Hwy 2. In 1970 the church was demolished and in the words of newspaper clipping, the "church was in remarkably good condition." 1841 Whites Church - An article from a souvenir booklet printed to celebrate the 100th anniversary in 1941. 1971 demolition of the Church. Note: The first 6 lines of the memorial are extremely faint and difficult to read. The spelling is as written, however some capitalization, paragraphing and punctuation added for clarity. Also note the memorial was created in the ‘tenth year’ of King George’s reign which would be 1830 and was registered in 1841. King George IV died in June 1830 and was followed by William IV who was replaced by Queen Victoria in 1837. This Memorial was likely copied from the original one and the Indenture added in 1841 when the Methodist Church was built. To the Registrar of the County of Hastings in the district of Victoria, A memorial to be registered pursuant to the statute in such case made and provided … … … … whereas in and by a statute of the Province of Upper Canada …… in the tenth year of the reigning King George the fourth entitled ….. for the …. of Religious Societies therein named it is enacted then? wherever any religious congregations of Presbyterians, Lutherans, Methodists, Congregationalists, Independents, Anabaptists, Quakers, Menonists, Tunkers and Moravians shall have occasion to take a covenance of Lands for the site of a Church Meeting House or chapel or a burying ground it shall and maybe lawful for therein to appoint Trustees to whom and their successors to be appointed in due manner as shall be specified in the deed. The requisite land for all or any of the purposes aforesaid not exceeding five acres for any one congregation may be conveyed And such Trustees and their Successors by the name expressed in such deed shall be capable of ? holding and possessing such land and of commencing and maintaining any action or actions in law or in Equity for the protection ???? and of their right there to and whereas a Religious Congregation or Society of Methodists have occasion to take such a deed of a tract or parcel of land situate in the Township of Sidney in the County of Hastings in the Victoria District in the said province for the site of a Church, Meeting House or Chapel and burying ground and have appointed Trustees of the Methodist Episcopal Church in Canada, Meeting House or Chapel or burying ground in the Township of Sidney. Now this Indenture made the eighth day of February in the year of our Lord one thousand eight hundred and forty one, between Reuben White of Sidney, aforesaid, yeoman of the one part and John Gilbert of Sidney, aforesaid, yeoman, Philip Carman of Sidney aforesaid, merchant, John Kelly of Sidney aforesaid, yeoman, Caleb Gilbert, of Sidney aforesaid, yeoman, John Bradshaw of Sidney, aforesaid, yeoman, Henry Goldsmith of Sidney aforesaid, yeoman, James Chisholm of Sidney aforesaid, yeoman, the Trustees aforesaid of the other part, Witnesseth that the said Reuben White for and in consideration of the sum of two hundred pounds of the lawful money of the Province to him in hand paid by the said trustees before the sealing and delivery? being the receipt whereof hereby acknowledged hath given granted bargained sold assigned released conveyed and confirmed and by these presents? doth give grant bargain and sell assign release convey and confirmed and paid John Gilbert, Philip Carman, John Kelly, Caleb Gilbert, John Bradshaw, Henry Goldsmith and James Chisholm by the name aforesaid of the Trustees of the Methodist Episcopal Church in Canada Meeting House or Chapel and burying ground in the Township of Sidney and their successors to be approved in the manner hereinafter specified. All that certain tract or parcel of land situate on the east side of Lot Number twelve in the first concession of the said Township of Sidney containing by admeasurement one acre be the same more or less. Which said tract or parcel of land is butted and bounded or maybe other wise known as a ?????? that is to say the meeting house or chapel lot begins at a stake in the corner crotch of the road and proceeding from thence North sixteen degrees west two chains and twenty links to a stake then seventy degrees west three chains and fifteen links to another stake then south sixteen degrees east four chains and four links to the main road then along said road to the place of beginning containing by admeasurement one acre of land or ground with the building or buildings erected or to be erected thereon. To have and to hold said tract or parcel of land with the building or buildings erected or to be erected thereon and all the appurtenances and ????? thereof to them the said Trustees and their successors ?? in the said trust forever for the site of a church Meetinghouse or burying ground for the use of the members of the Methodist Episcopal Church in Canada according to the rules and discipline which ???? or thereafter? May be adopted in the general or annual Conference of the said Church in Canada in trust and confidence that the said Trustees for the time being shall all times hereafter be ??? any Methodist Episcopal Minister or preacher or Minister or Ministers he or they being a Member or members of the Methodist Episcopal Church in Canada and duly appointed as such in the aid general or annual conference to preach or perform religious services in the said house and burial services in the said burying ground according to the rules and discipline of the said church and in further trust and confidence that the said Trustees for the time being may at their direction may permit the stationed Minister or Preacher of any other orthodox ?????? denomination of Christians to preach and perform public religious services in the said house which is that might be required for the use of the minister or preacher of the said Methodist Episcopal Church in Canada. And it is hereby declared to be the true intent of this deed that the full number of Trustees in trust shall continue to be seven and that whenever any among the above named trustees or their successors in the trust shall die or cease to be a member or members of the Methodist Episcopal Church in Canada according to the rules and discipline of the said church the vacant place of the trustee or trustees so dying or ceasing to be a member or members of the said church shall be filled with a successor or successors being a member or members of the said church of the age of twenty one years to be nominated as follows that is to say to be nominated by the stationed minister or preacher in charge of the said church for the time being within whose station or circuit the said tract or parcel of land shall be and thereafter appointed by the surviving trustee or trustees of the said trust if they proper to appoint the person or persons so nominated and in of an equal division of the votes of the trustees present, the said stationed minister or preacher shall have a casting vote in such appointment, and if it shall happen at any time that their shall be two surviving trustees of the said trust in that case it shall and may be lawful for the stationed Minister or preacher shall have the charge of that station or circuit for the time being to nominate and the quarterly conference of that circuit or station if they approve of the persons so nominated to appoint the requisite number of Trustees of the said church then present . And in case of an equal division of their votes in such appointments and the person or persons so nominated and appointed trustee or trustees in either of the said modes?? Of the nomination and appointment shall be legally successor or successors of the said above named trustees and shall have in perpetual successors in the same capacities. Present rights and duties as are given the said above named trustees in and by this deed and the statute aforesaid and to the end that evidence of the due nomination and appointment of succeeding trustees in the said trust may be preserved. It shall be the duty of the trustees for the time being to keep a book of record in which the Minister or preacher ??? ???? nominated and appointed successors in the said trust as aforesaid and also the names of the persons so nominating and appointing them shall be entered and such entry subsanbed?? by the said nominator or appointers. Which deed is witnessed by Jacob W Meyers Jr and Samuel B Gilbert of the Township of Sidney, yeoman, and this Memorial thereof is required to be registered by John Kelly one of the trustees above named its witnessed and sealed seventh day of December 1841. Signed Samuel B Gilbert signed John Kelly L.S. Yeoman, maketh oath and say that he was present and says this Memorial as well as the deed to which it relates duly executed and that he is subscribing witness to both deed and memorial. One of the founders of White's Church, Reuben White, came from one of the oldest American families. He, himself, was a follower of William Lyon Mackenzie during the Rebellion of 1837. He was a rebel, was captured and condemned to be shot, but later pardoned and served for fourteen years as a member from Frontenac County in the Parliament of Upper and Lower Canada. His father, William White, was a Loyalist, who fought in the Loyal Rangers, a regiment formed by General Sirncoe, our first Governor-General, during the American War of Revolution. The other founders named as Trustees were yeomen, humble, honest farmers, with the exception of Philip Carman, who was a prosperous merchant. These men occupied the pulpit in the absence of a minister. Douglas White, Trenton business man, is a descendant of Reuben White. His grandmother, Eliza Ann White, was a pew holder and worshipper of White's Church all through her married life. White's Church is a plain, unpretentious structure, about forty feet wide and sixty feet long, and can seat five hundred people. The auditorium and gallery are used for Sunday School work, with ten teachers and sixty scholars, under the popular Superintendent, Mr. W. Jeffery. It has three aisles on the ground, floor and a gallery above, and while the pews are disarranged in the gallery, owing to Sunday School and ladies' work, it appears there were two rows of pews which went all around the building. We understand when the Church was first built it was lit by candles in sconces fastened to tee walls. Later it acquired a chandelier, having several candles, which were not always in good working order. Candle light was replaced by kerosene oil light, with bracket lamps and chandeliers hanging toy iron rods. The old relics are in the sheds. In our modern day we enjoy the electric light. The interior is on the old-fashioned plan. Its first pulpit was a wooden structure, surmounting three sustaining pillars, closed in all around, but with doors on each of two sides. The approach from the floor was by a curved stairway connecting with each door. When ministers were settled on this Circuit they did not like to be "cribbed cabined, and confined", and agitated a change, and in due time the old pulpit disappeared, to be succeeded by a rostrum with a communion rail, a small pulpit and choir platform. The larger pulpit was a necessity when the auditorium and gallery were filled with a sincere and worshipping congregation. There was no organ or piano to lead the singing in the old days, but it vas led by the Leader of the service, mostly a layman, who, on some occasions, used a violin and handled this musical instrument with expert ability. In these pioneer days the Church services were well attended, when the auditorium and gallery would be filled to capacity. There were morning and evening services, with a class meeting in the afternoon. Through the week there was a prayer meeting and fellowship service. Our older worshippers often speak of the good old days of the horse and buggy. Later, when a minister was in charge of the Circuit, a choir was organized under the leadership of no mean reputation, and the violin was supplanted by an organ; then the singing was exceptionally good. The choir still boasts of good singers. Mr. Albert Jones is leader, and Miss Mary Rush, pianist. The Church, affectionately known as White's Church, was "a work of faith and a labour of love" for a loyal congregation with no minister as leader. It has passed through many battles and has been the scene of many revivals led by sainted men of God in days when they believed in the old-fashioned revival, and prayed until they received showers of blessing. These were the days when the old Methodists lived the simple Christian life and aided the cause they loved by precept and example. Source: Booklet titled Centennial Souvenir, One Hundredth Anniversary Whites United Church, 1941, p 10/11. He was born in Fredericksburg, Oct 30, 1799, and died on the Sidney Circuit, Dec. 22, 1851; survived by his wife and a large family, also by his 85-year-old father, a M.E. local preacher, 5 brothers, and 1 sister. The week before his death, Mr. Sills was assisting his son in a protracted meeting on the Brighton Circuit. - Jan. 15. 1852, p. 19. With deep feelings of sorrow I have to inform the Methodist Episcopal Church, through the medium of your paper, of the loss of one of its ministers who has been suddenly and unexpectedly called away from the work of the ministry, and from those labors in the Church in which he so much delighted. The Rev. JOHN SILLS who was stationed on Sidney Circuit departed this life on Monday, Dec 22, 1851, aged fifty-two years and two months. For the gratification of his friends, I will give a short sketch of his life, character and sudden decease. My remarks will be brief, in anticipation of a more extended memoir will appear in the minutes of the next Annual Conference. Mr. Sills was born in Fredericksburg, C.W. October 20, 1799 of Methodist parents, his father being a Local Preacher in the M.E. Church which standing he still retains at the advanced of of eighty-five years. Mr. Sills from childhood was made acquainted with the duties he owed to his God and at an early age embraced the religion of Jesus, and exulted in the cross of Christ. But his christian course was somewhat interrupted by the machinations of the enemy of all souls; he being in the slippery paths of youth and possessing more than ordinary social feelings, was led astray from his duties but never from a corrrect view of the solemn obigations which he was under to his God; which was ever present with him, admonishing him of his duty, until he finally gave up all and followed Christ, not only by holy living, but by proclaiming to a perishing world salvation through the atonement of Jesus. As a christian minister he preached the gospel with earnestness and affection with a heart warmed by his subject, not thinking of himself, not seeking applause, but solicitous for the happiness of mankind, being tenderly concerned for the people among whom he labored and deeply impressing them with the worth of the human soul; with the glory and happiness to which it might be exatled, and with the misery and ruin into which it will be plunged by irreligion and vice. He preached not to amuse, but to convince and awaken--not to make the people think of him, but of themselves--of their own characters and future condition--he labored with unaffected ardor to set forth religion in its most attractive form, by displaying the divine character of God, and the love of Christ, by unfolding the blessedness of the heavenly world, and warning the people to shun the awful consequences of sin; which he continued to do to the day of his death. He preached in the chapel near where he lived (called White's Chapel) on the Sabbath previous to his decease, and on Monday following gave up his charge into the hands of his Master, and went home--I might say without a sigh or groan. His passage through the "valley and shadow of death" was momentary and unexpected. While preaching on the Sabbath, he felt a depression, or more properly, a spasm in the upper part of his chest, which caused him to lean upon the pulpit, but it soon subsided and he finished his sermon, but so deeply was impressed that the time of his departure was at hand; that he told the congregation that he believed his prayer was being answered, that God would allow him to preach as long as he lived, and that he was then addressing them for the last time--which proved but too true, as on Monday he was again seized with a spasm as before, and without a struggle or a groan, threw back his head and expired in the arms of his companion. I might here state that he had been laboring hard in a protracted meeting on the Brighton Circuit, assisting his son, the week previous to his death, where success had attended his labors, and many were made to rejoice through the instrumentality of his preaching. His career, though short, was a useful one--as a preacher he was not eloquent but successful. He preached by example as well as precept and his memory will be cherished in the hearts of the people among whom he labored, with more than ordinary regard and, although dead, he still lives as a pattern and way-mark to the kingdom of Heaven. He has left a widow and large family of children, together with an aged father, five brothers, one sister, and a very numerous circle of relations and friends to mourn his loss. The funeral service was performed by the Rev. J.F. Willson, Presiding Elder of the Bay Quinte District, and a sermon preached in the chapel from 2nd Timothy 4th Chap, 6, 7 and part of the 8th verses, to a large assembly. His subject was clearly elucidated, and his conclusions of feeling, and calculated to rivet impressions upon the minds of his audience, never to be effaced. While speaking of the loss the Circuit had sustained in the removal of its minister, a thrill of keen sensibility appeared to pass through the whole assembly and echoed back a sign and a groan--a response which could only express the emotions of their souls. His address to the mourners, amongst whom was his aged father leaning upon his staff, was deeply affecting. He pointed them to Heaven where their father and friend had gone, and where they, too, might secure an eternal inheritance. After the sermon was concluded, his remains were taken to Fredericksburgh to be interred among his old neighbors; by whom he was beloved and respected, where he was born and spent most of his life. Here another sermon was preached by the same Rev. gentleman from Job 19th Chap, 25, 26 and 27th verses. And as I fear I have been trespassing too much upon your columns already, I will merely remark that upon the occassion, Mr. Willson appeared to be completely captivated by his subject; views of God--the gospel--the resurrection--and the reward of the righteous, were opened up before him, and his utterance was such as proved to his audience that his "Redeemer liveth" and that they too will have an part in the resurrection, "whether they be just or unjust." And the will of thy God, thy last moments engage. Bright angels are hovering around his low bed. A low voice which saith, "weep not for the dead"
BAYSIDE — White's Church was built in 1841, 15 years before the Grand Trunk Rail­way reached the Quinte Dis­trict and 26 years before Con­federation. Nevertheless, the structure remained relatively unchang­ed through the years. Although some worn portions were re­placed, it was never entirely reconstructed or added to in any significant way. The most basic change was removal of a 150 foot tower and spire, constructed by the original architect, a Frenchman whose name is unknown. A much shorter square tow­er replaced the once-com­manding 150-foot structure. Yet Alphonse Gingras, who is currently demolishing the 40-by-60-foot white frame structure, says: "It's in re­markably good condition; the majority of the timbers and wood are still solid. Only parts of the roof and ceiling and some portions of the building near the ground were suffering from rot," he said. Basis for this soundness is the church's pine construc­tion and 'timbers, 10 inches square and up to 40 feet long. Mr. Ghigiras, who bought the one - acre property on which the church is situated for future development, said he would use the hand-hewn timbers for a dock, and sal­vage as much as possible of the remaining pine lumber. He noted that the floor of the balcony, which extended across the back of the church and along both sides, was made of hand planed tongue-and-groove pine boards. The tongue-and-groove boards on the main floor were milled, but this is believed to be the second floor laid in the church's 128 year history. An unusual aspect of the church's construction was the use of hand - made wooden pins to nail roof sheeting to the rafters. Although wooden pins were used at that time to join beams, iron nails were available and commonly used for roof sheet­ing. Historical value of portions of the old building has not been lost. Church officials set aside some pews and lumber to repair the 178-year-old Hay Bay Church, first Methodist Church in Upper Canada. Souvenirs always come to light during the razing of an old building, and White's Church was no exception. Some pennies, the oldest dated 1895 and strawberry social tickets dated 1927 were found. Price of admission to the 1927 event was 35 cents.